So you’ve been up Helvellyn by day, traversed the Fairfield Horseshoe too, maybe even summited the mighty Scafell Pike. Have you ever wondered what it would be like to walk to these summits in time for sunrise? 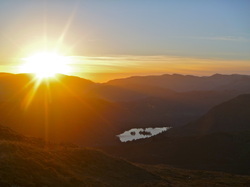 Or arrive in time for sunset and marvel at the amazing Lakeland scenery on a cool clear summer night. As landscape photographers know well, first & last light are by far the best times to capture the finest images of the mountains. We can arrange this for you for any of the Lakeland mountains, be it Loughrigg or Scafell Pike. Not only is this a thrilling experience, it can also offer the most spectacular of views imaginable. And surprise surprise, there's usually no one else around! The very best days we have enjoyed on the Lakeland fells have been at first and last light, it's magic and can't possibly be described, it must be experienced to be understood. I remember a quote from a successful entrepreneur that was along the lines of 'get up early and go to bed late'. It may well pay dividends in the business world, but the feeling of watching sunrise and sunsets from mountain tops surpasses this on every level, amazing. Do it!